The guest editors of the Special Issue entitled “Ten Years Working Together for a Sustainable World”, Professors Biagio F. Giannetti, Cecília M. V. B. Almeida, Feni Agostinho, Zhifeng Yang, Gengyuan Liu, are pleased to announce that the papers of the 6th IWACP are potential candidates for this Special Issue of the Journal of Environmental Accounting and Management. We welcome papers dealing with the conference theme of achieving a global audience to promote discussions about the role of Cleaner Production as a requirement for achieving a sustainable world. The Call for Papers will be disclaimed during the 6th IWACP. Environmental protection and assessment of environmental impacts and climate change effects. Sustainable logistics and supply chain management. The “India and Sustainability Standards: International Dialogues & Conference” is conceived and organized by the Centre for Responsible Business (CRB) in partnership with several partner organizations. The event has now become a much awaited international sustainability conference based in India. In 2017, the event will be held from 15-17 November at India Habitat Centre (IHC), New Delhi. The theme of this 2017 conference is “From Tragedies of the Commons to the Strategies for the Commons”. The event offer an occasion to dialogue on challenges and opportunities presented by international and Indian Sustainability Standards and Collaborative Sustainability Initiatives, in supporting business and policy contributions towards positive social, economic and environmental impacts in India and beyond. More information at http://www.sustainabilitystandards.in. This Call for Papers is also open to colleagues who will not be able to attend the conference in India during November 2017, but who wish to submit their papers for potential publication in this special volume. Submissions for this special volume should be done through an email direct to guest editor Biagio F. Giannetti at biafgian@unip.br. Please add in the subject email the following: “Special issue of JEAM: sustainability as a strategy for the commons”. The massive exploitation of natural resources by humans is strongly affecting biodiversity and the functionality of natural ecosystems. High environmental quality is a key aspect to ensure the delivery of ecosystems goods and services vital for human health and well-being. For this reason, the development of the scientific knowledge about structure and functionality of aquatic and terrestrial ecosystems and the assessment of the impacts of human activities can be applied at different scales in the framework of sustainable management practices. This special issue will gather theoretical, methodological, and applied papers on: characterization and functionality of aquatic and terrestrial ecosystems, relationships between chemical alterations and biological components of ecological communities, ecotoxicological studies, chemical, biological, and ecotoxicological indicators to assess environmental quality, and environmental accounting tools useful to assess environmental costs and impacts of human activities. Please submit your manuscript by e-mail to pierpaolo.franzese@uniparthenope.it. pierpaolo.franzese@uniparthenope.it (Managing Guest Editor) indicating in the subject of the message “special issue SITE/BIWAES-JEAM”. Energy and resource constraints are increasingly becoming a concern for populations, scientists and policy-makers. The need to implement multi-task policies capable of maintaining or improving the present living standard, ensuring business and jobs opportunities as well as preserving environmental integrity and natural capital is becoming a priority in international strategies. One of the most demanding challenges for human beings in the near future is the development of new energy policies characterized by low environmental impacts, prevention of resource scarcity and the possibility of achieving sustaining economic competitiveness. Within such a context, this Special Issue (SI) of the Journal of Environmental Accounting and Management will focus on recent developments and visions in the field of the energy and resource efficiency in order to implement sustainable environmental policies at different scales including process, sectors and economic/social levels. Final deadline is February 28. All papers will be peer-reviewed and a final decision about acceptance should be made by the end of July. Resources are essential for the sustainability of human society. The sustainable management of resources therefore is critical for addressing many societal challenges we are facing. Interdisciplinary approaches are required to develop solutions for sustainable resource management. The International Conference on Resource Sustainability (icRS) serves as a platform for researchers and practitioners around the world with diverse background and expertise to share the most recent ideas, outcomes, and practices on resource sustainability. 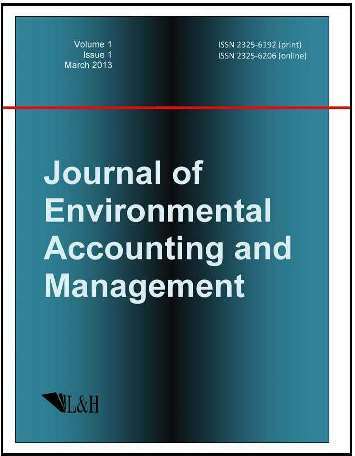 After the conference, a special issue in Journal of Environmental Accounting and Management is therefore necessary to be dedicated to environmental accounting and management problems facing resources sustainability. Before submission the authors should carefully read over the journal’s Author Guidelines, which are located at https://www.lhscientificpublishing.com/journals/JEAM-Default.aspx, and submit an electronic copy of their complete manuscript via the email to liugengyuan@bnu.edu.cn. In the spirit of strengthen academic communication, the sharing of academic achievements between faculties of higher education in China on an international level, to improve student’s ability within scientific research and innovation, with the goal of jointly solving global environmental problems. School of Environment, Beijing Normal University, in conjunction with BNU office of International Exchange and Cooperation, and State Key Laboratory of Water Environment Simulation shall be launching the first session of International Students’ Ecology and Environment Forum. The theme for the maiden forum is “Caring for Earth’s Ecology and Environment, Building a Brighter Future’. The Inaugural International Symposium on Water Modelling (iSymWater2019), hosted by Beijing Normal University, will be held on July 8-11, 2019 in Beijing, China. The symposium is dedicated to exchanging knowledge and ideas for modelling techniques and applications in water engineering in order to mitigate the impacts of ever-increasing water crisis and relevant environmental pressures and to promote multi-disciplinary solutions to protection and restoration of water system and ecosystem. All papers submitted to the special volume will be peer-reviewed in accordance with the standard procedures of Journal of Environmental Accounting and Management. •	REVIEW articles giving in-depth overviews of certain topic or reviews on research achievements. •	EDITORIALS providing important essays of the editors and invited scholars or overviews on certain topic written by guest editor(s) of special issue. To prepare their manuscripts, authors are asked to closely follow the JEAM “Guide for Authors” at https://lhscientificpublishing.com/journals/JEAM-Default.aspx. Authors should submit their papers via the journal's online submission system. Submitted papers should not have been previously published or be currently under consideration for publication elsewhere. Papers must be written in good English. Authors with limitations in the command of written English are recommended to have their papers edited by a ‘Native English Scientific Editor’ before the first submission to JEAM because poorly written pieces can compromise the decisions during the review process.